Metabolism means the sum of all chemical changes in a cell or the body of an organism. It has two subdivisions: catabolism and anabolism. Catabolism (from the Greek cata, meaning "down") consists of all those reactions in which large molecules are broken down into smaller ones, with a release of energy from their chemical bonds. Examples include the digestion of a protein into amino acids that the body can absorb from the diet and use in its own metabolism, and the breakdown of stored glycogen in the liver to supply energy between meals. These breakdown processes are known chemically as oxidation reactions. Anabolism (from the Greek ana, meaning "up") consists of all those reactions that assemble small molecules into larger ones and store energy in the newly formed chemical bonds. Examples include the assembly of amino acids into muscle proteins and the synthesis of glycogen and fat for energy storage. These synthetic processes are known chemically as reduction reactions. Metabolic rate means the amount of chemical energy liberated in the body per unit time. Chemical energy is measured in calories (the amount of energy that will heat 1 gram [0.035 ounce] of water by 1 degree Celsius [1.8 degrees Fahrenheit]), although a calorie is such a small unit that it is more practical to think in terms of kilocalories (kcal). One kilocalorie is 1,000 calories, or what dietitians (and food labels) call a Calorie with a capital C. Metabolic rate is generally expressed in kcal/hour or kcal/day. A person's metabolic rate can be estimated by having him or her breathe from a spirometer, a device that measures the person's rate of oxygen consumption. Every liter of oxygen consumed represents the release of approximately 4.82 kcal of energy from organic compounds such as fat and glycogen. This ratio varies, however, depending on what type of energy-storage molecules the person is oxidizing at the time of measurement. Metabolic rate depends on such variables as physical activity, mental state, fed or fasting status, and hormone levels, especially thyroid hormone. The basal metabolic rate (BMR) is a standard of comparison that minimizes such variables. It is measured when a person has not eaten for twelve to fourteen hours and is awake, relaxed, and at a comfortable temperature. It is not the minimum rate needed to keep a person alive; the metabolic rate is lower than the BMR when one is asleep. Total metabolic rate (TMR) is the BMR plus the added energy expenditure for movement and other activities. Metabolic rate is elevated not only by physical activity but also by eating, anxiety, fever, pregnancy, and other factors. Factors that reduce the TMR below normal include depression, apathy, and prolonged starvation. The TMR is higher in children than in adults. Consequently, as people approach middle age, they often gain weight even with no change in food intake. Weight-loss diets tend to be frustrating not only because most of the initial weight loss is water, which is quickly regained, but also because the TMR declines with time; as the diet progresses, fewer calories are burned and one begins to synthesize more fat even with a stable caloric intake. The average young adult male has a BMR of 2,000 to 2,500 kcal/day, and the average female slightly lower. Thus, one must consume this many calories per day just to sustain such essential processes as the heartbeat, respiration, brain activity, muscle tone , renal function, and active transport through cell membranes. The central nervous system accounts for about 40 percent of the BMR and the muscular system for 20 to 30 percent. Even a relatively sedentary lifestyle requires another 500 kcal/day, and hard physical labor, as in farming or manufacturing, may require up to 5,000 kcal/day. Two metabolic states, absorptive and postabsorptive, are defined by the time elapsed since food intake and by corresponding changes in the body's energy processing. The absorptive (fed) state lasts for about four hours during and after a meal. It is a time when the body is absorbing digested nutrients, using some of them to meet immediate energy needs, and converting the excess to energy storage products. This state is regulated mainly by the hormone insulin, which promotes cellular uptake of glucose (blood sugar) and amino acids; glucose oxidation; and the synthesis of glycogen (glycogenesis) and fat (lipogenesis). Because of the rapid cellular uptake of glucose, the blood glucose level falls under the influence of insulin. Insulin is thus called a hypoglycemic hormone (from hypo, meaning "low"; glyc, meaning "sugar"; and em, meaning "blood"). 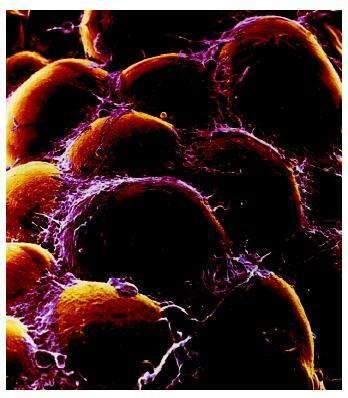 A scanning electron micrograph of fat cells that make up adipose connective tissue. The sympathetic nervous system issues commands to adipose tissue that mobilizes fuels such as glucose and fatty acids. state is dominated by hyperglycemic hormones, which raise the blood glucose level and thus make glucose available to the brain and other organs that require it. Hyperglycemic hormones include glucagon, cortisol, growth hormone, epinephrine, and norepinephrine. Collectively, these hormones promote glycogen breakdown (glycogenolysis), fat breakdown (lipolysis), and the synthesis of glucose from amino acids and fats (gluconeogenesis). The sympathetic nervous system also plays a major hyperglycemic role, issuing nerve fibers to liver, adipose tissue, and muscular tissue that directly stimulate glycogenolysis and lipolysis. The sympathetic nervous system is involved especially in conditions of fear, anger, injury, and other forms of stress. Thus, it mobilizes fuels such as glucose and fatty acids to meet the demands of the "fight or flight" state and tissue repair and recovery. Berne, Robert M., and Matthew N. Levy. Physiology, 4th ed. St. Louis, MO: Mosby, 1998. Ganong, William F. Review of Medical Physiology, 19th ed. Stamford, CT: Appleton and Lange, 1999.